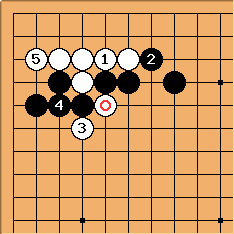 After the wider pincer at , a sequence comparable to that after the nearer pincer follows. Because the pincer does not give enough support, at does not work well here. 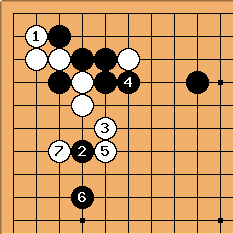 Instead, black plays at , with the followup shown here. 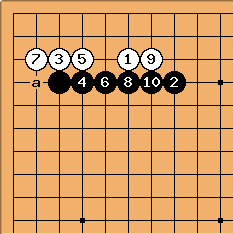 The near high pincer at is a relatively modern move; as far as I know it was not played before the 1990s. 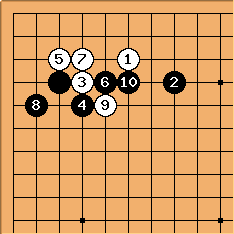 Its intention is to build a position facing the left. 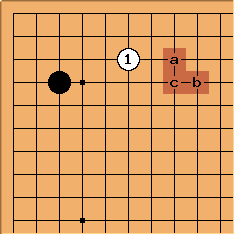 If White attaches at the 3-3 point, the position reverts to a position from the 4-4 point low approach one-space high pincer. However, White is more likely to attach at the 4-4 point in this case. 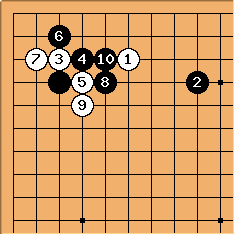 The moves to are joseki; is the most common continuation. This shows one possible continuation; is (together with the cut at ) a vital point of this position.